One of the things I love about majesty palm is that it looks good everywhere. No matter what your décor style is or what room you want to place it in, majesty palm has the right look and feel. It’s no wonder why majesty palm is one of the most popular palms grown indoors. The plant is versatile, elegant, and easy to grow. Here’s what you need to know about growing majesty palm as a houseplant. Like most palms, this guy prefers a lot of light – so pass on those dimly lit spots and showcase it near a bright window, patio door, or beneath a skylight. One general rule to determine lighting is that if it casts a medium to strong shadow throughout much of the day, it should be bright enough to keep a majesty palm happy. Here’s one place where a lot of people inadvertently go wrong. A lot of us think of palms and envision the desert. But majesty palms are actually native to areas along streams and rivers. So the secret here is to keep the soil moist, but not wet or soggy. Don’t let it dry out. As you might guess from a plant that naturally grows near bodies of water, it likes a spot with abundant humidity. Happily, it adapts to average humidity just fine. But, if your home gets especially dry, your palm might prefer a humid spot like a bright bathroom. If you want to increase humidity around it, grow it over a wide, shallow tray filled with water and pebbles (so that the top of the plant sits above the water, on top of the pebbles). The water in the tray will evaporate, adding moisture to the air right around your plant. A lot of people ask me about misting. While you can mist your plant with water, it’s not all that helpful. It does increase humidity—until the water evaporates. It’s better to use a pebble tray or humidifier. Keep those fronds lush and dark green by fertilizing in spring and summer with any general-purpose houseplant fertilizer. As with any product, be sure to follow the directions on the packaging to know how much to use. You don’t have to fertilize as frequently as the packaging says (they’re trying to sell you more fertilizer, after all); you can get by doing it as little as once or twice between March and July. The more you fertilize, of course, the faster your palm will grow. 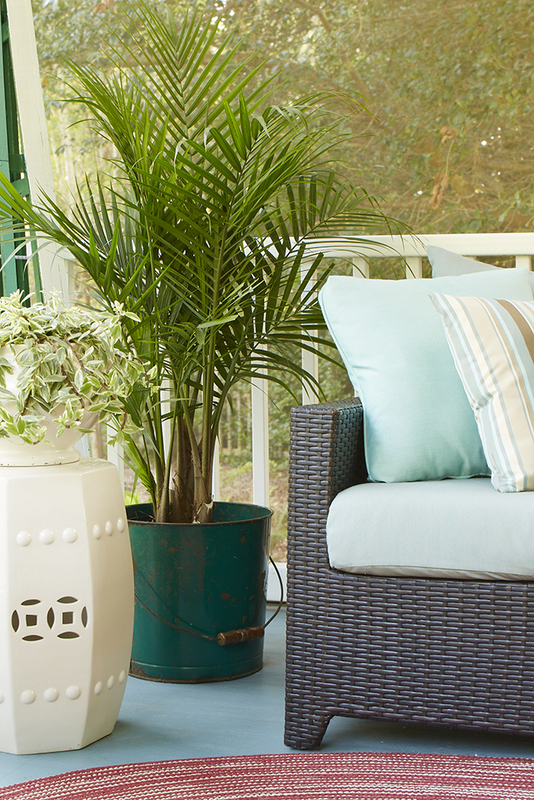 Majesty palms are largely pest-free, but the one issue you may run into is spider mites. These tiny critters are almost invisible to the naked eye, but you’ll see their damage by tiny stippling on the leaves. Another telltale sign: webbing, like fine spider webs. Keep spider mites at bay with abundant humidity and by giving your majesty palm a shower with room temperature water once a month or so to keep the leaves clean. Learn more about growing majesty palms indoors!